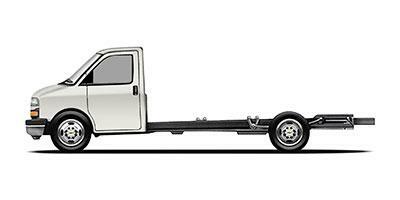 This truck is equipped with a 10-foot Supreme Service Body. Our advertised price does not include the body. Please call for details! This truck is equipped with an 11-foot Reading Aluminum Classic Service Van Body. Our advertised price does not include the body. Please call for details! This truck is equipped with a 14-foot Bay Bridge Box. Our advertised price does not include the body. Please call for details! The new Chevrolet Express Commercial Cutaway comes with several upfit options so you can adapt it for your business. Some of the most sought after upfit options include ambulance/rescue vehicles, utility vans, shuttles, and school buses. The V8 engine will help you to have all the power you want in this van. The vehicle’s rear vision camera will help you back up securely and prevent collisions. Browse our inventory of the Chevrolet Express Commercial Cutaway models in South Portland to find the features that you are looking for. Call us at (800) 607-2996 or contact us online to schedule a test drive. We look forward to meeting you!